Some coaches believe in choosing various forms of motion offenses in their zone offensive attacks that will then give freedom to their offensive players and also create a high level of unpredictability to opposing defenses. Coaches disagreeing with this type of philosophy will state that unpredictable movement is good, but movement with no purpose or fundamental value is not good. It is difficult for the proper player to have proper movement at the proper time. This ‘motion’ philosophy may also give individual offensive players so much freedom that their indecisiveness in choosing their movement may actually stifle the movement desired. Many offensive players (and teams) may need more structure in their offensive play and more help in their offensive decision making. Another group of coaches believe in maintaining a high level of controlling what their individual players can and cannot do, based on the coaching staff’s evaluations of individual and team’ offensive abilities. This can be achieved by utilizing half-court continuity offenses that provide structure to offensive players. We want to institute somewhat of a blend of both philosophies and try to get the best of both worlds. And that is a continuity offense that can smoothly transition from one phase to the final phase, which is a continuity offense that has some freedom as well as a structure in the form of rules. Every time a player has the basketball and makes a pass to one of his other four teammates, there is a rule that provides structure and helps guide the movement of all five players. It is not a rigid offense because the player with the ball realistically has at least three (of his four) teammates that he can almost always pass the ball. Each pass from any of the five “spot-up” locations then has at least three potential pass receivers. Therefore, there is the freedom of making the pass to different players and thus a high degree of unpredictability of what movement takes place after the unpredictable pass is made. Depending on which zone offense is utilized, there are various (movement-of-players) rules based on the type of pass that is made. The various types of (purposeful and fundamentally sound) movement by players are dictated by the type of pass that is made. There are possible passes from a ‘wing spot-up’ location down to a ‘deep corner spot-up’ location that includes a corresponding movement rule. Passes from a ‘wing spot-up’ location down to a ‘short-corner spot-up’ location has its own movement rule. There can be passes made to post players that possesses “inside pass” rules. There must be “wing pass” rules, “skip pass” rules, “down pass” and “up pass” rules as well as “reverse pass” rules. The opposition will have a high degree of difficulty knowing the type of movement that follows the specific pass that was made and therefore defending that type of movement. These rules give the offense a degree of structure, but still provides freedom of fluid and unpredictable movement by all offensive players. We want to place all of our offensive players “in positions to succeed.” This means that every offensive play/entry out of the offensive sets/alignments has multiple objectives. The initial objective of every play/entry is to immediately “place the right people in the right place” so that those players can utilize their specific strengths, minimize their individual weaknesses and therefore have better opportunities to score quickly and directly off of the play. Another major (but not immediate) objective of each play is that if the entry does not produce a shot, all five offensive players end up in what we call “spot-ups.” These “spot-ups’ are the five specific locations/positions on the floor that allow the designated continuity offense to immediately flow from the finished entry into the designated continuity offense—giving the opposition’s defense absolutely no time to adjust or recover from their attempt of defending the offense’s entry. This philosophy of flowing smoothly and immediately from half-court entries/plays (that do not produce shots) should and is incorporated from the other offensive avenues of attack—Press Offenses flowing into Primary Fastbreaks that flow into Secondary Fastbreaks into the designated continuity offense as well as from ‘Defense-to-Offense’ Primary Fastbreaks that flow into Secondary Fastbreaks into the desired continuity offense. In addition, all Baseline and Sideline Out-of-Bounds plays should also possess the ability of smoothly and instantly flowing into the continuity offense that is to be executed. Utilizing various plays can highlight individual player’s offensive skills while attacking weaknesses of both individual defenders as well as the overall team defense in the form of quick-hitting plays. These plays can also serve as a conduit to smoothly flow into the designated continuity offense. The entries can move the zone defenders as well as disguising how the offensive team is proceeding to attack the zone defense. This adds another layer of unpredictability to the overall offensive attack. The zone defense must first place all attention and effort into attempting to stop the entry/play and without any time for reorganization or regrouping to then attempt to defend the continuity zone offense. 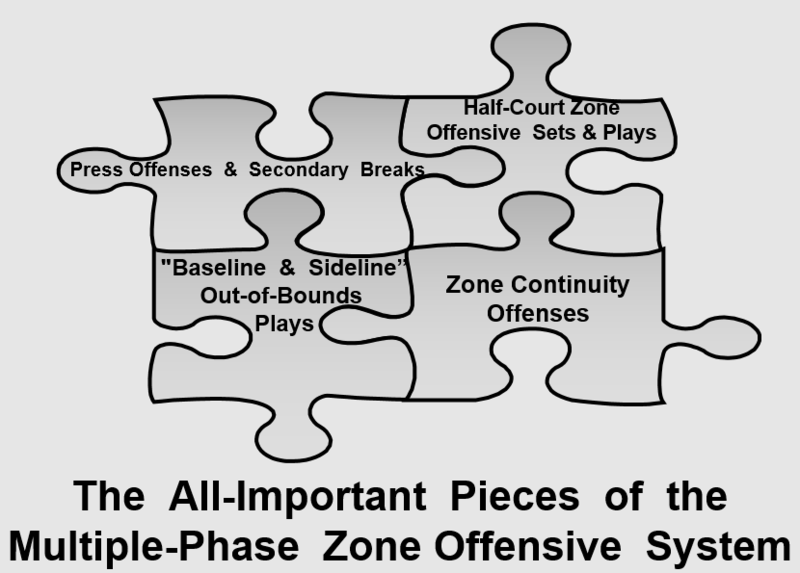 This is the philosophy behind each and every zone continuity offense and its package of entries/plays that we firmly believe in. It must be emphasized that a team can have an excess of entries/plays as well as too many different continuity zone offenses. Therefore, a coaching staff must evaluate its personnel both physically and mentally to make sure the correct offenses and the correct number of offenses are chosen. Concept 1: A successful zone offensive package must require simplicity (for its own offensive players) possibly as its main component. Players must know what their assignments and responsibilities are in each phase of the offensive attack. Coaching staffs must evaluate their team’s mental abilities as much or more than their squad’s physical skills and talents to determine its mental capacity and how much that team can utilize other important characteristics and traits such as ‘’Fluidity,’ Multiplicity,’ ‘Flexibility,’ ‘Expandability,’ ‘Adaptability’ and ‘Unpredictability.’ From these characteristics comes the ability to be so unpredictable to opposing defenses that the offense can have such high degrees of success. Concept 2: Regardless of the number of offensive sets utilized and the number of offensive plays/entries/quick-hitters that are implemented; each play must have the ability to instantly, seamlessly and fluidly flow into the chosen continuity zone offense. This gives the offensive package separate (on paper) phases of offensive attack that blend so smoothly that it appears on the court to be one long continuous offensive assault on the opposition’s zone defense. This is the very important ‘Fluidity’ characteristic. Concept 3: Once the ‘Simplicity’ factor and the ‘Fluidity’ trait has been integrated into the package, many other very important characteristics/traits can be implemented, with the ‘Multiplicity’ trait quite possibly being the most important. This is because the ‘Multiplicity’ characteristics are the bridge to many other more valuable traits. Being able to have multiple plays, multiple sets/alignments and multiple continuities is invaluable to an offensive system. This allows the offense to be more varied and less predictable to opposing defenses, while still maintaining a degree of simplicity for your own team. Concept 8: Utilize a primary and secondary fast break system that is compatible with and that fully complements your zone offense package. Concept 9: Use different sets/alignments and entries/plays to be more varied and less predictable to opposing defenses. Various sets and entries can be used to become less predictable to the opposition while still maintaining a degree of simplicity for your own team. 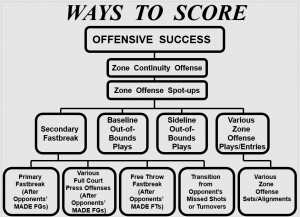 Concept 10: Every zone defense has inherent weaknesses. Coaches should learn the particular styles of the zone defense that are being used by your opponents (the basic slides and responsibilities in that zone) so that they may attack and capitalize on the weaknesses of each defense. Concept 12: Having a zone offense continuity with clearly defined responsibilities and assignments can create levels of specialization that will showcase individual player’s talent levels and improve the overall effectiveness of the zone offense. Concept 13: Capitalize on your offensive personnel’s individual strengths via various entries/plays or different alignments/sets. Concept 14: Use different entries and/or alignments to capitalize on an opposing individual’s defensive weaknesses. Make sure that the ending spot-ups of each entry/play fit the beginning spot-ups locations of the designated continuity offense. Concept 15: With some zone offensive sets, begin certain offensive plays/entries with ‘false ball movement’ and/or ‘false player movement.’ This concept could be compared to a football team “shifting” from one offensive formation and actually ending up in a different offensive formation before the action actually begins (causing defensive problems). Concept 16: If an offensive team is mentally able to handle it, some offensive sets can be camouflaged by actually beginning in one alignment, then using a form of ‘false ball movement;’ before then ‘shifting’ into the actual desired zone offense set. Concept 17: Make sure that defensive transition responsibilities (i.e., preventing opponents from getting into their fast break offense) are clear-cut and carried out by all five players in the zone offense. 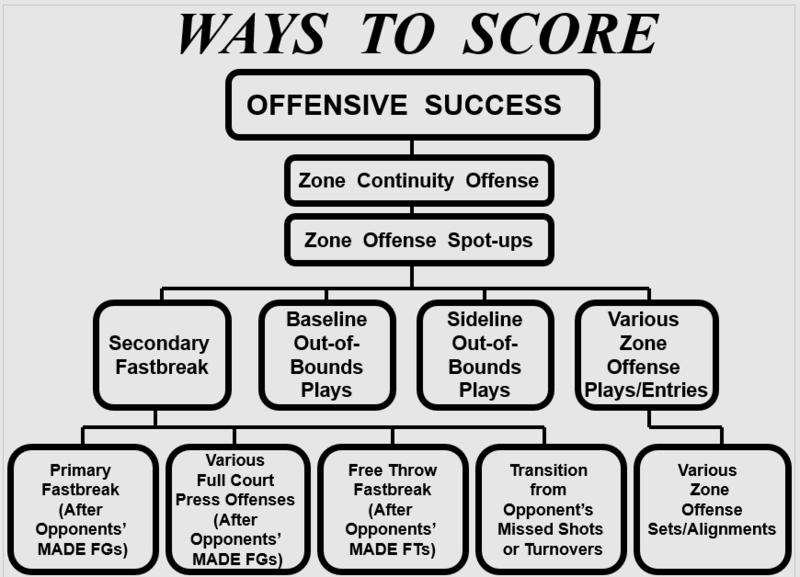 Concept 18: Have clear-cut offensive rebounding responsibility rules for all five players in the zone offense and make sure that they are executed by every player in the zone offense. Concept 19: Reverse the ball to force the defensive zone to defend both sides of the floor. This allows the zone to horizontally stretch and therefore weaken the defense. Concept 20: Attack the zone defense from behind the defense’s back-line of the zone with various types of cuts, often from along the baseline. This is another way of stretching the zone defense vertically. Concept 21: Flatten the zone defense by getting the basketball down to the baseline and then reverse the ball quickly to the opposite side of the floor. This is another way of stretching the zone first in a vertical manner and then in a horizontal manner. Concept 22: Maintain good floor balance and spacing in the zone offense. Concept 24: When catching the basketball, zone offensive players should be prepared to become immediate offensive threats as shooters, passers, or dribblers. Concept 25: Zone offensive players should remember the value of ball fakes and shot fakes. All zones are ball oriented and will react to the basketball. Concept 26: Zone offensive players should remember the value and then utilize skip passes. Concept 27: Screen defenders in the zone defense with on-the-ball screens and/or off-the-ball screens (such as back, flare, pin and interior screens). Concept 28: Using cutters (from the perimeter who cut through the heart of the zone defense to the opposite side of the offense) is another effective method of attacking zone defenses. Concept 29: Anytime the ball is passed into the middle of a zone defense, the receiver should look to ‘extend the pass,’ to a teammate that is closer to the basket and on to the opposite side of the floor from where the original pass originated. Concept 30: If the ball is passed inside to a post player, perimeter players should flare-cut to the various soft spots in the zone defense and be prepared to quickly catch and shoot off of the pass. This cutting action after inside passes are made again can stretch the zone both vertically as well as horizontally. Concept 31: Post players should ‘gap-cut’ in the middle of the zone defense. Once the defense’s perimeter has been stretched thin, the middle is vulnerable and should be attacked. Attacking the middle of the zone with ‘gap cuts’ starting from behind the zone should be very productive. Concept 32: Zone offenses should have an ‘inside-out’ perimeter shooting attack as well as an ‘outside-in’ type of attack. Concept 33: When passing the ball to offensive post players, perimeter players should use bounce-passes away from the post defenders (unless it is a lob pass to a player behind the zone). Concept 34: Offensive post players should look to obtain (and maintain) body position advantages over their post defenders. Concept 35: If zone defenses try to deny the inside scoring of the offense, ‘skip passes’ should be utilized to attack the defense’s weaknesses in its over-commitment of its interior defense. Concept 36: After ‘skip passes’ are made, post players should seal off the post defenders that deny them the ball on the original ballside and be prepared to receive the pass from the original weakside. Concept 37: When zone defenders react to the ‘skip pass,’ a second ‘skip pass’ back to the original ballside can be very effective. A phrase “One good ‘skip pass’ deserves another” should be taught and utilized in every type of offense that is used. *The “Show-and-Go-Opposite” offensive post move. *The “Square-Up and Up-and-Under” move. *The “Whirl” Move (sometimes called the ‘Olajuwon Move’). *The “Duck-In” Move into either a power move or a face-up move. *The “Spin-­and-Post-Up” move when the defense is fronting the ‘duck-in’ move. Concept 40: The “(False) Motion” concept is when offensive personnel move from their original locations (on a designated time) after the ball and player movement—disguising what the offense’s final alignment and intended action (to confuse and weaken the defense. Concept 41: The “Combo Offense” concept is executing one continuity offense and when at a designated ‘trigger point,’ the offense simply converts to an entirely different continuity offense with no delays or interruptions.